Beautiful bride Tuva on her wedding in August at Villa Podernovo. Tuva chose the Laks by Lisa - foldable clutch bag in warm silver/ metallic salmon leather with powder colored zipper. Wedding dress by Leila Hafzi. On June 17th, the exhibition JAPANOMANIA opened at Nasjonalmuseet in Oslo. During this event (until October 16th) you have the chance to buy the origami - inspired hair bows in the museum stores at both Kunstindustrimuseet and National Gallery. They are designed exclusively for this event and are available in 5 stunning color variations. Today I visited both Kunstindustrimuseet and the National Gallery to deliver a batch of folded bow - hair accessories to each store (more about that in another blog post later). 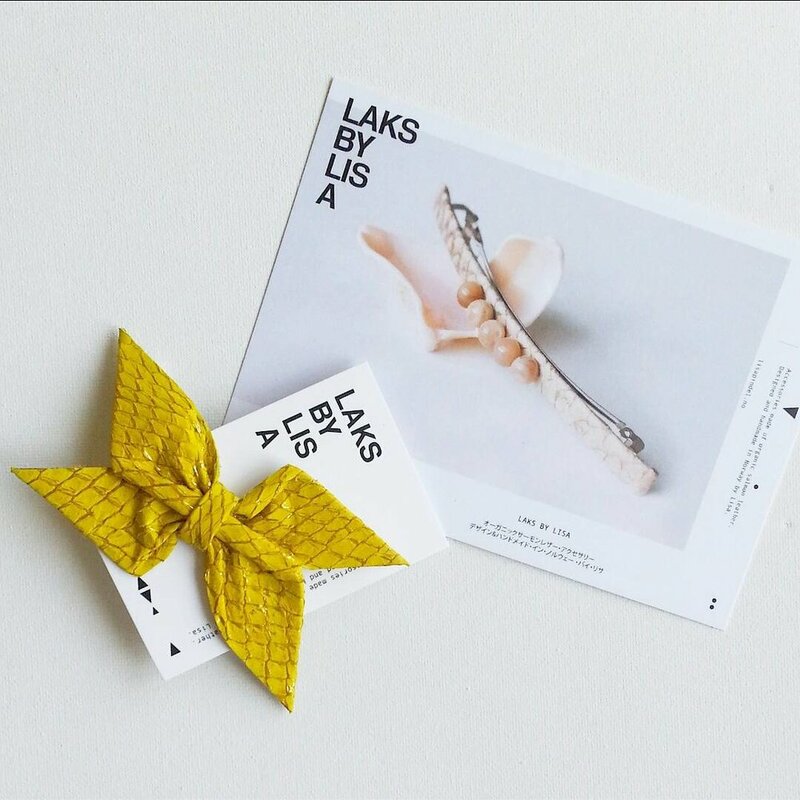 Below, a picture of Laks by Lisa - display at National Gallery Museum store. They are currently sold out of all classic hair accessories, which is great to hear. It is also very nice to see that the other products, such as the sparkling earrings, are displayed in the one of the finest locations of the store! Beautiful store display at the Oslo Museum of Decorative Arts and Design. Accessories served on color - matching glass trays by Yngve Havstad. There has not been much activity here in the last weeks, but lots of things going on right now! We are currently working on the new website which will finally be released in April and which will be the new web platform for Laks by Lisa in the future. There will still be a link to this blog and we`ll keep on posting all news here. The website will also include a webshop, so all international customers will then be able to order easily and directly. Apart from that, even more spring accessories are in the making. Photos will be posted very soon!